26 Alden Street, the Grace Gouveia Building, by David W. Dunlap (2012). Grace Gouveia, by Jay Critchley. In a town whose economy turned on the luck of the fishery, poverty was often no farther away than one capsized boat or a couple of empty nets. By 1870, there were so many poor people that Provincetown constructed this large Alms House, also known as the Town Asylum, to shelter them. 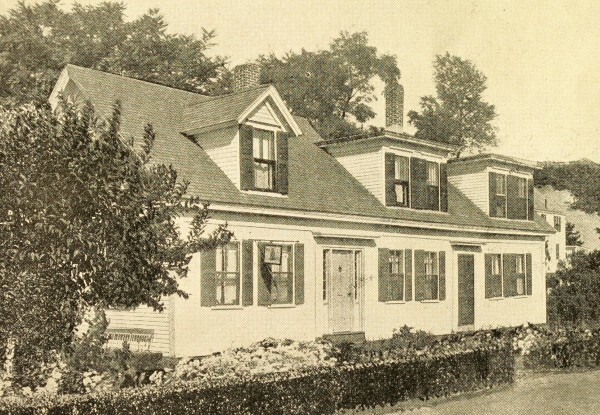 In 1956, it was transformed into a municipal nursing home called Cape End Manor, which was housed here until a new facility was built at 100 Alden. The asylum was converted into town offices and renamed the Grace Gouveia Building, in honor of Grace Gouveia. This beloved teacher, poet, and social activist immigrated from Portugal in 1915, at the age of 6. She died in 1998. 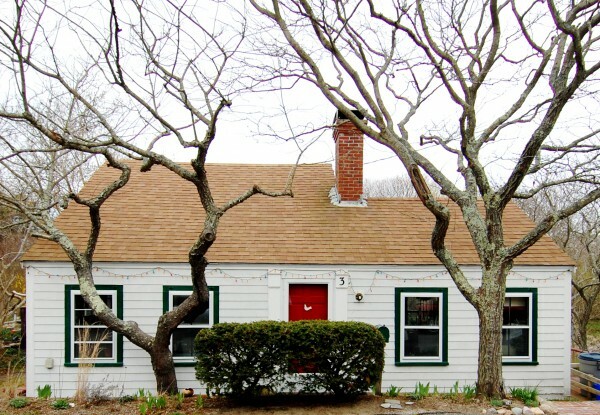 100 Alden Street, Seashore Point, by David W. Dunlap (2012). 100 Alden Street, Cape End Manor, now demolished, by David W. Dunlap (2008). 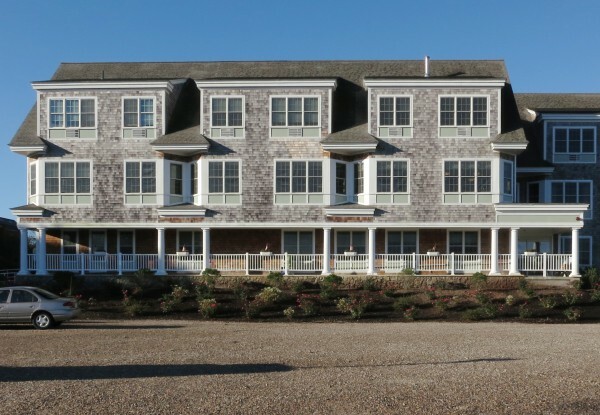 The official name for this “concierge condominium” complex is Seashore Point. 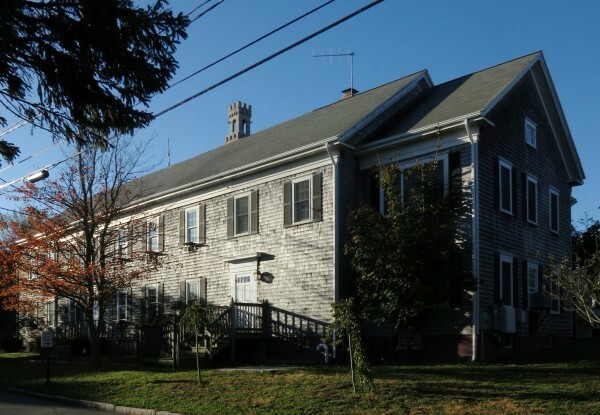 But you’ll often hear it called the Manor — “She’s up at the Manor these days, God love her” — since it supplanted and eventually replaced the Cape End Manor, a municipal nursing home that was built on this site in 1980 to replace the facility at 26 Alden. In 2006, management was transferred from the town to Deaconess Abundant Life Communities and ground was broken on the first 43 units of Seashore Point, designed by EGA Architects. The first residents, Dr. Richard and Barbara Keating of Truro, arrived in 2008. The final 38 units were completed in 2014. 124 Alden Street, the Calvary group in the Cemetery of St. Peter the Apostle, by David W. Dunlap (2012). Catholicism and Portuguese national identity are closely tied together at the Cape end, as even the briefest stroll through the 12-acre Cemetery of the Church of St. Peter the Apostle will reveal, on headstones carved with names like Avellar, Cabral, Cordeiro, Corea, Costa, Duarte, Dutra, Ferreira, Flores, Lopes, Macara, Santos, Silva, Souza, and Taves. The land was acquired in 1869, even before the church was built. 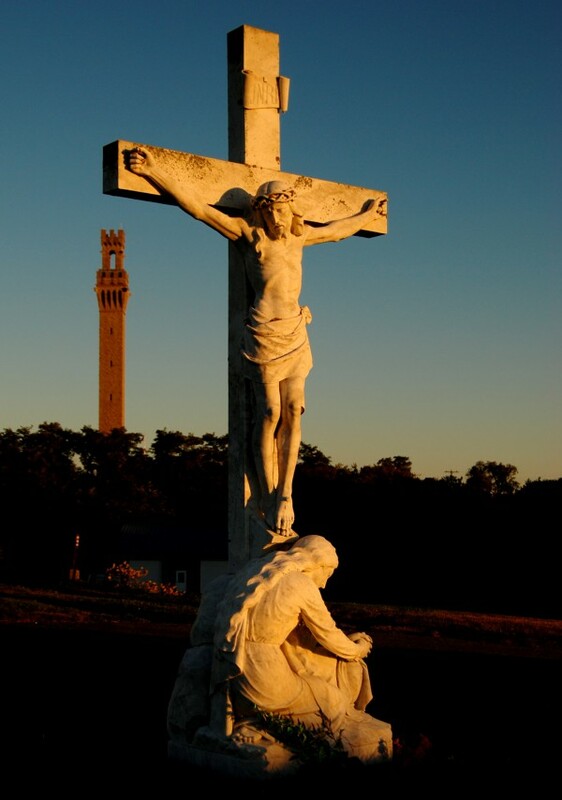 It is owned by the Roman Catholic Diocese of Fall River. Renovations of the cemetery were begun in 1952, during the pastorate of Msgr. Leo Duart, who also bequeathed money for the construction of the cemetery chapel, which opened in 1976. The sculptural scene of Calvary (pictured) was donated by the Rev. 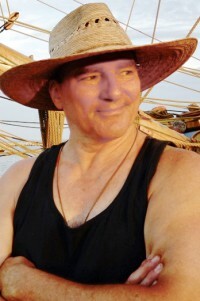 Manuel Terra. 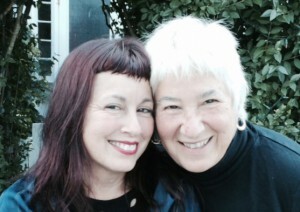 Mary DeAngelis and Marian Roth, courtesy of Marian Roth. 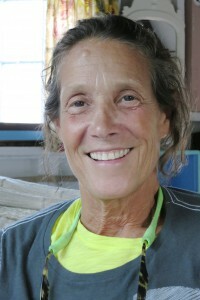 Barbara E. Cohen, by David W. Dunlap (2012). Built around 1800 on Commercial Street, the house was moved to this site and opened in the late 1920s as the Ship’s Bell (“because of the gladness that was ringing in our hearts”) by Eleanor Bloomfield and Mary “Ivy” Ivins. They called themselves “independent women.” Contemporary eyes might see the Ship’s Bell as the town’s first lesbian-owned guest house. It was later owned by Charles Hapgood, author of The Earth’s Shifting Crust, and his wife, Tamsin (Hughes) Hapgood, a real estate agent. Their son, William Hapgood, an inventor and musician, sold it in 2001 to the artist and photographer Marian Roth, and the clothing designer Mary DeAngelis. Hapgood owns the garage, No. 2A, whose attic apartment shelters the artist Barbara E. Cohen. 3 Allerton Street, by David W. Dunlap (2010). 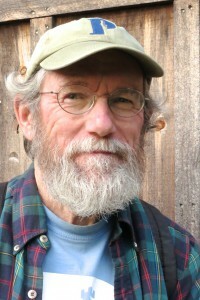 Daniel Towler, by David W. Dunlap (2013). 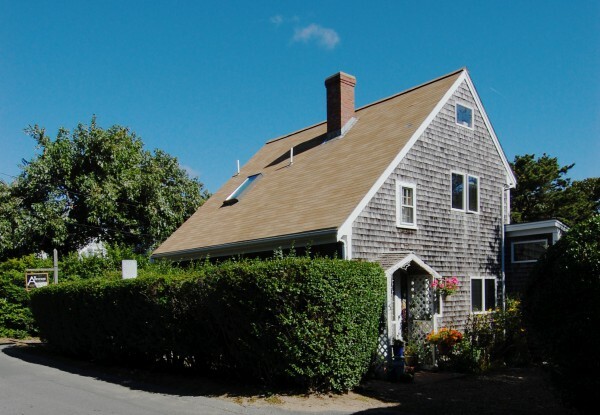 James Thomas, a member of the Bonedome Construction Company, who ferried people and supplies to the dune shacks in a specially modified Model A Ford (that was how he met the artist Edith Hughes, who was to become his wife), built this house and three-car garage in 1938. 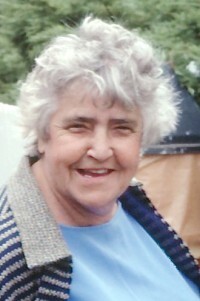 Their daughter, Michal (Thomas) Barnes, lives in Ohio but still owns this property. Daniel Towler, one of the town’s more informed and passionate historians, has lived here since 1995. Edith’s backyard studio has been used by the potter Debbi Kahn, the sculptor Paul Bowen, and the painter Bert Yarborough. In recent years, the painter Alyssa Schmidt sold miniature landscapes from a roadside stand here, on the honor system. 5 Allerton Street, by David W. Dunlap (2009). 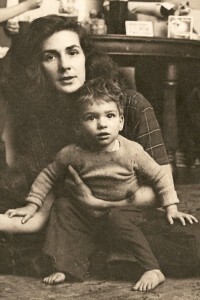 Roger Rilleau, courtesy of Gaby Rilleau (1948). Peggy and Kim Rilleau, courtesy of Gaby Rilleau (1952). Kim Rilleau, courtesy of Gaby Rilleau. 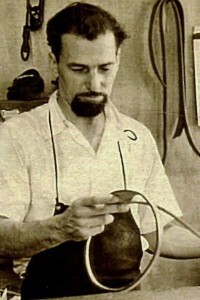 The Rilleau Sandal Shop was founded in 1940 by Roger Rilleau as Hand Industries, at 322 Commercial. It moved to 347 Commercial, then to this property, which had been known to generations of postcard buyers as the Rose-Covered Cottage, said Gaby Rilleau. Kim Rilleau, son of Roger and Peggy (Tryon) Rilleau, conducted the business in a workshop here from 1968 to 1997. It was “cluttered with dyes, driftwood, sculpture, whale bones and dusty shelves filled with hand tools,” Sue Harrison wrote in The Banner, and carried “the deep, rich smell of leather that new cars can only aspire to.” It was more recently Pat McCobb’s Allerton Custom Picture Framing business. 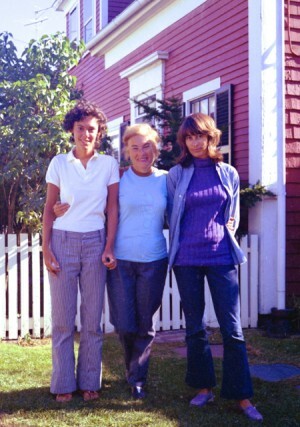 Mira, Resia, and Naomi Schor, courtesy of Mira Schor (1970). In 1969, Resia Schor, an artist herself and the widow of the artist Ilya Schor, bought this house, which was constructed around 1800, for her and her daughters Naomi and Mira Schor. She called it Ça Me Suffit — “It is enough for me.” Resia worked in the oldest part of the house, a former fish shack, making jewelry and sculpture. Mira painted upstairs in a small room with seashell-patterned wallpaper from the ’50s. Naomi, a noted scholar who died in 2001, worked in an upstairs room with a bay view. After Resia died in 2006, Mira began drawing in her mother’s studio, which she said “proved to be an engine for new work.” Resia and Ilya are buried in Town Cemetery, under a strikingly Modernist tombstone.